Emergency jackets are not that common a piece of kit, but there are some advantages to carrying one. There's a balance between the amount of spare kit you should take and what you're likely to use. When it's cold, instead of taking an extra fleece or mid-layer that's never used, which will add weight and bulk to your rucksack and slow you down, you could consider taking an emergency jacket instead. That is not to say that you should take so little that you have a likelihood of using the jacket, as they are for unforeseen situations or extreme cold only. In a situation where you or a member of the group was getting dangerously cold, the emergency jacket would be put on, ideally under a waterproof jacket so that thermal properties are maximised. After donning the jacket you'd should start to warm up, which would be a good time to cut the day short and walk off the mountain under your own steam. The alternative for someone exhibiting signs of hypothermia is to get into a survival bag and/or storm shelter to attempt an initial re-warm on the hill. Staying moving and getting off the hill is always preferable to stopping. If you're leading a group, carrying one of these should be standard practice in case one of the group becomes dangerously cold. 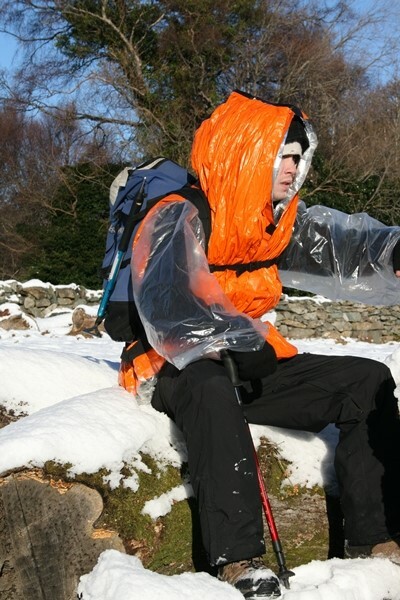 Made from the same material as foil blankets, and weighing in at about 50 grams, these jackets are extremely light in weight and take virtually no room in your rucksack. Thermal properties are not as good as Blizzard Survival Jackets (below). View foil ponchos in the MountainSafety shop. These jackets are made by the same people who make Blizzard Surival Bags, and work using the same 'reflexcell' material, and come in 2 & 3 layer versions. The silver lining reflects your body heat, and the reflexcell material traps warm air, thus reducing heat loss. They weigh in at only 230g*, are vacuum packed so take approx 0.5 litre (11 x 11 x 3.5 cm*) volume inside your rucksack. The jackets have a hood are plastic arms, are 100% water and windproof and still allow the wearer to be completely mobile. They even have a tog rating of 6, making them equivalent to 3 season sleeping bags. Having either of these two kinds of jacket stashed at the bottom of your rucksack will save taking a more bulky alternative, together with being invaluable in any emergency situation. 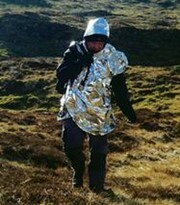 Emergency jackets are routinely used by mountain rescue teams.